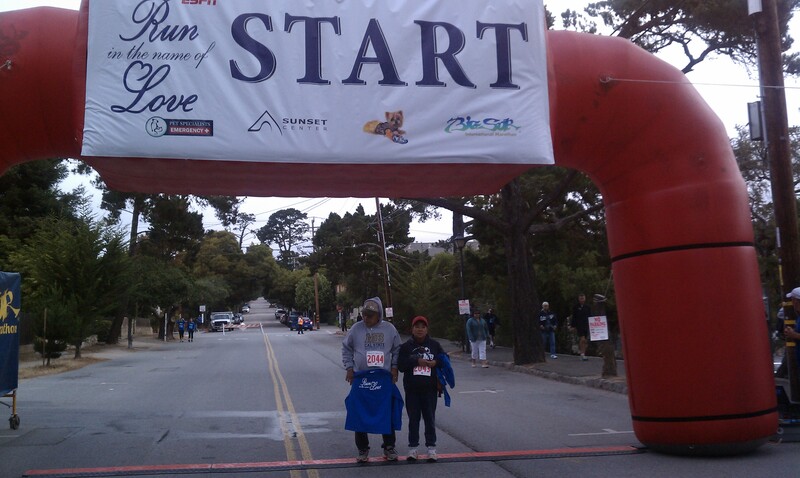 The 10th presentation of the Big Sur Half-Marathon took place on Sunday, 18 November 2012. This is the tenth time I’ve run this race. I talked to a friend who also ran this race and we both agreed – it was an off day for both of us. I had difficulty catching my breath and struggled to find a rhythm. Not sure why but I’m glad that I figured out early on in the race that it was going to be an off day for me so I reset my expectations and had a great time. I usually pick up my race packet and go to the expo on Saturday but since my brother was here and running for his first time, we went on Friday afternoon. I realize that the people handing out the race bibs are volunteers but if they don’t want to be there, they shouldn’t be there. We waited about 5 minutes for the volunteer taking care of our two ranges of numbers to come to his station, even though other volunteers had told him that he had a line. And when he finally did get around to taking care of us, he wasn’t the most pleasant person even though my brother and I were being as nice as could be. It was as if someone hit him with the grumpy stick when he woke up from his post-lunch nap. I don’t usually buy anything at the Big Sur Half-Marathon expo just because it’s the last one of the year for me. 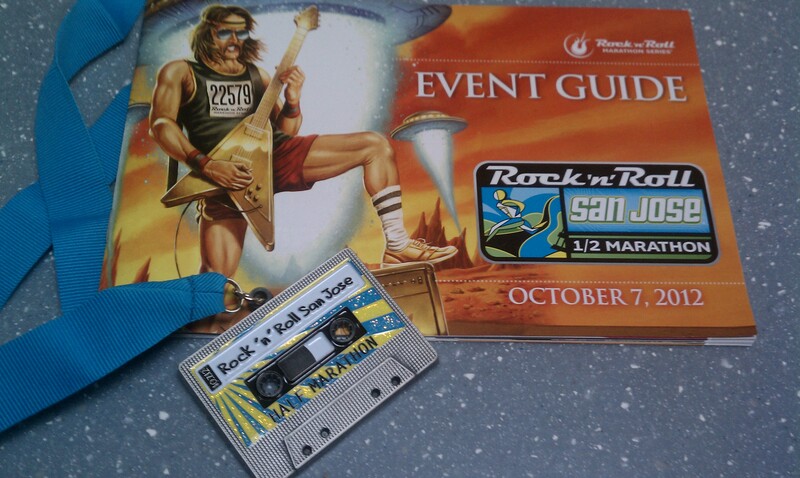 By the time this event rolls around, I’ve already gotten everything I need at the Rock ‘n’ Roll San Jose Half-Marathon expo or online at Road Runner Sports. This time, though, I picked up a new running skirt and saved on the shipping and handling fee by buying it at the expo. I’m not a fan of the Big Sur Half-Marathon’s virtual goody bag. It cheapens the whole experience for me. And it makes me a lot less likely to actually visit any of the vendors that had coupons in the virtual goody bag because I won’t bother to print out the coupons or flyers. I understand the whole point of the virtual goody bag but I don’t like it. As we were walking up to the corrals, the announcer asked if anyone could sing the National Anthem. Apparently, the singer that was supposed to be there didn’t make it. Someone in the crowd volunteered – I think she was a spectator and her son was running the half-marathon – and she was fantastic. I hope the race organizers got her contact information and ask her back next year because I have not heard such a pure and simple rendition of the National Anthem in a very long time. There were no trills, no runs, no vibrato, she didn’t sing in an octave that was beyond her control – she sang it simply and she sang it well. The wave start was much, much better than last year. The Big Sur Half-Marathon race bibs are personalized with the race registrant’s name – there is no option to have a phrase like, “In Honor of…” imprinted on the bib. Because race bibs – the selling of and the transferring of – have been on my mind a lot lately, I was looking at the race bibs in my corral. I noticed a guy wearing a race bib with the name Jennifer. He very definitely did not look like a Jennifer. Nor did he look like he was running in honor of a Jennifer. Obviously someone named Jennifer had sold or given her bib to this guy. Since this was my tenth time running this course, there weren’t any surprises. The course has not changed in the last couple of years. The scenery is always breath-taking, though, no matter how many times I see it. A few of the aid stations ran out of cups. One aid station was reduced to using soup bowls. The second and third to the last aid stations were completely out of cups by the time I passed through so that meant no water or Gatorade unless you were carrying your own bottle. Not everyone carries their own bottle because they rely on the aid stations so to have two or three aid stations run out of cups is not good. The sad thing is that even though I’m a slow runner, I wasn’t the slowest one on the course so I felt bad for the other runners and walkers behind me. The race organizers tweaked the “finish village” a bit this year so it was confusing for me. I’m not sure if it was better or worse but the end result was the same. I got my official finisher’s photo taken by the MarathonFoto photographer. The photographer I chose was having fun with the finishers and having us strike poses. 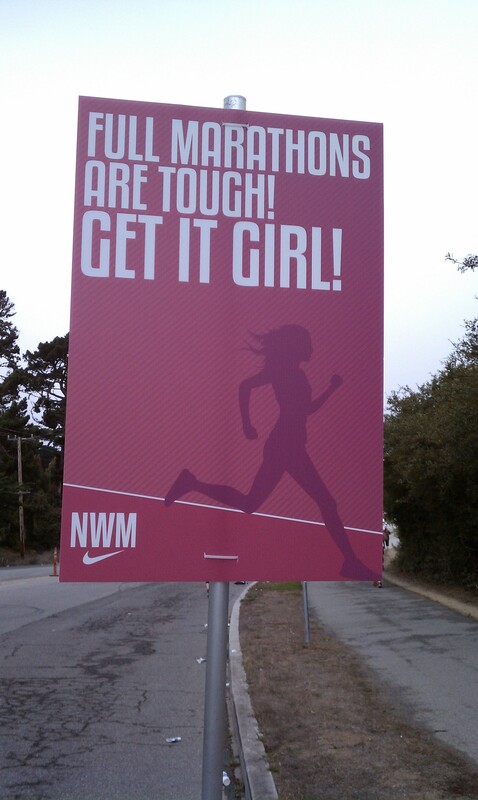 Instead of the usual finisher’s backdrop, they had arranged it so that the background was the wharf and Monterey Bay. I thought that was a great touch. After all, if you have great scenery around you, why shouldn’t you incorporate it? The food tent was as efficient as last year. Goodies were already pre-bagged except for the cookies and bagels, which made sense because then you could choose what flavor of cookie and/or bagel you wanted. The low-fat chocolate milk was plentiful and delicious. I understand the whole point of being environmentally friendly and sustainable but the cups of water are just not sufficient or efficient for the end of a race. Since my brother had done the event with me, I didn’t bother to check out the soup or beer booths. Maybe next year. Thumbs Up: This was my big brother’s first race ever and his first half-marathon ever and he did great! Thumbs Down: The weather report that predicted rain and more rain. Thumbs Up: We had sunshine instead of rain. Thumbs Down: Disinterested volunteers handing out medals at the end. When you have to ask for your finisher’s medal, that’s just not cool. Thumbs Up: The enthusiastic volunteers and spectators along the course. Thumbs Down: Having the announcer go on and on about the pace group leader that finished just before I did…which meant not having my name announced as I crossed the finish line. Small touches like this are important. Thumbs Up: Seeing my name listed in the program as one of the “Grizzled Veterans” – the people who have run every presentation of this event. Thumbs Down: Having my name misspelled in that list and having the disclaimer that the people on the list self-reported. It shouldn’t take too much effort for the race staff to research and verify – that disclaimer was quite a detractor. Thumbs Up: All of the MarathonFoto photographers on the course meant a lot of photo choices – great job! 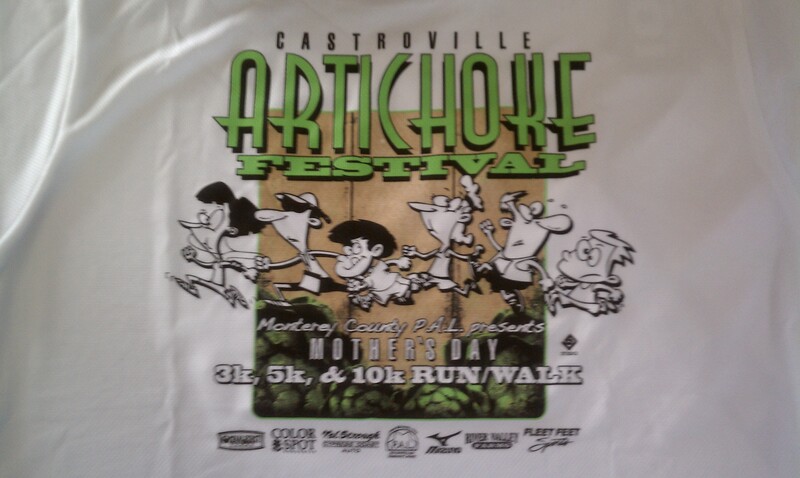 I’m looking forward to running this race again next year. Registration opens on 1 April 2013. 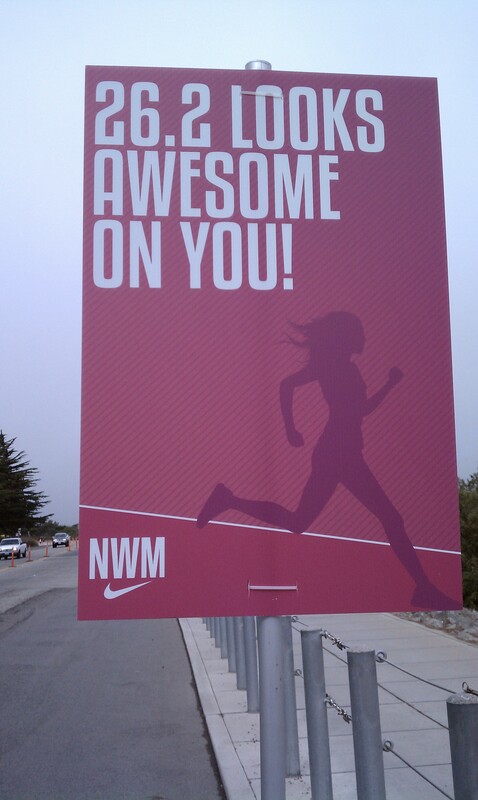 The 9th annual Nike Women’s Marathon (NWM) took place on Sunday, 14 October 2012. This is the second time that I’ve run this race. Someone made the comment on the NWM Facebook page that this event is really more of a half-marathon event and I happen to agree. It may have started out as a marathon event but once they added the half-marathon event, I think the focus has turned to making the half-marathoners happy. That’s probably because 2/3 or more of the 25,000 entrants are half-marathoners, not marathoners. It seems to be a pattern in my life that training during the fall and winter is good but then I fall off the wagon in the spring and summer. As with last year, my longest run leading up to this marathon was the Rock ‘n’ Roll San Jose Half-marathon the week before. I must be a masochist, right? I stayed in a hotel in the Civic Center part of town instead of going back to Nob Hill. 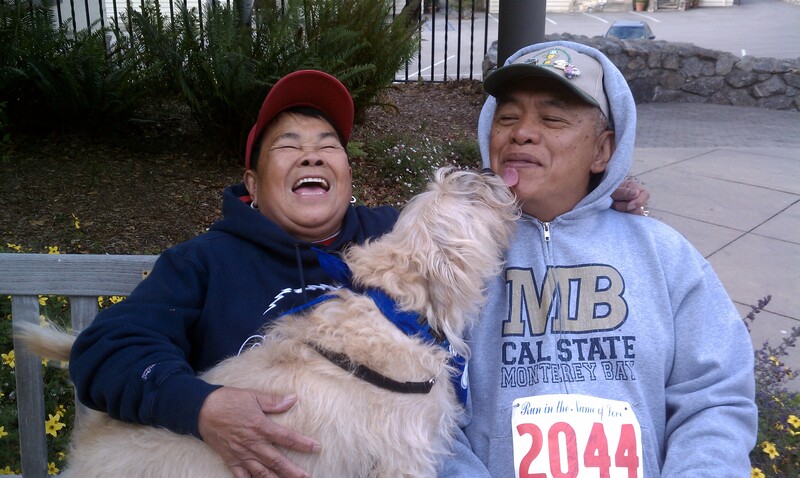 If I run this race again next year, I definitely will go back to Nob Hill. Getting hit on and begged from by the homeless people on Market Street was disturbing. This was my second time going through the Expotique and I didn’t like it any better this year than I did last year. In fact, I confirmed that I hate the Expotique. There were several entrances into the tent this year and the volunteers at the entrances were pretty lackadaisical and more interested in joking around with one another than in guiding people to the correct place. Once I reached a check-in spot, though, the check-in was quick and easy. Thank goodness I checked in on Friday because from the tweets and Facebook posts, the Expotique was a zoo on Saturday. Even though it wasn’t as packed on Friday, there were still long lines for everything. Moving through the crowd was next to impossible – I cannot imagine what it was like on Saturday. I grabbed my gear bag and headed over to Niketown because after trying to deal with my Garmin 405 for a couple of years, I decided that maybe I needed to switch over to the Nike+ SportWatch. The sales guy was helpful and I walked out of Niketown with a new toy. 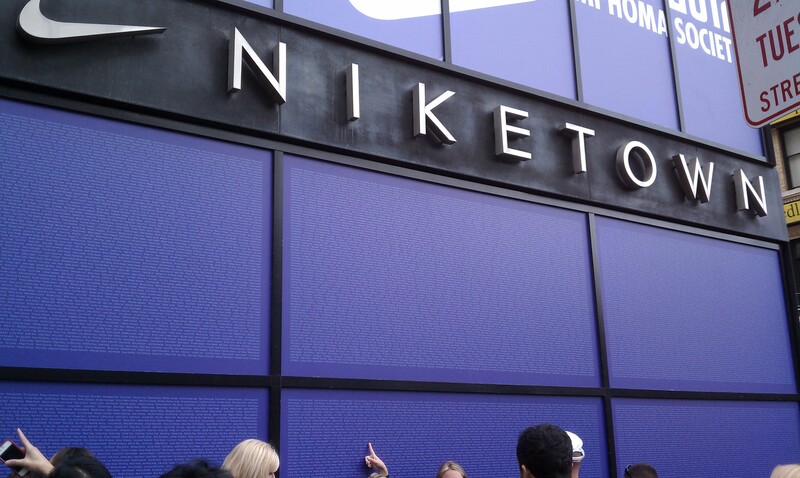 After taking care of business in Niketown, I found my name on the wall outside the store. Three times. The race swag consisted of a lot of little flyers and snacks. The snacks were great – I ate most of them while I was lazing around in my hotel room on Saturday. I didn’t pay attention to the flyers until after the race on Sunday. Too late, as it turns out, to take advantage of some of the things. Gear check was much more smooth this year. Nike must have listened to feedback from last year’s event and they rearranged the start corrals and had gear check buses for each corral. The volunteers at the gear check area were great – enthusiastic and helpful. The race start was something altogether different. Since I was honest about my expected pace and finish time, I was all the way in the back. And I mean all the way in the back. Really. After the gun went off, it took me more than 33 minutes to get to the start line. Under normal conditions, I wouldn’t have been concerned. 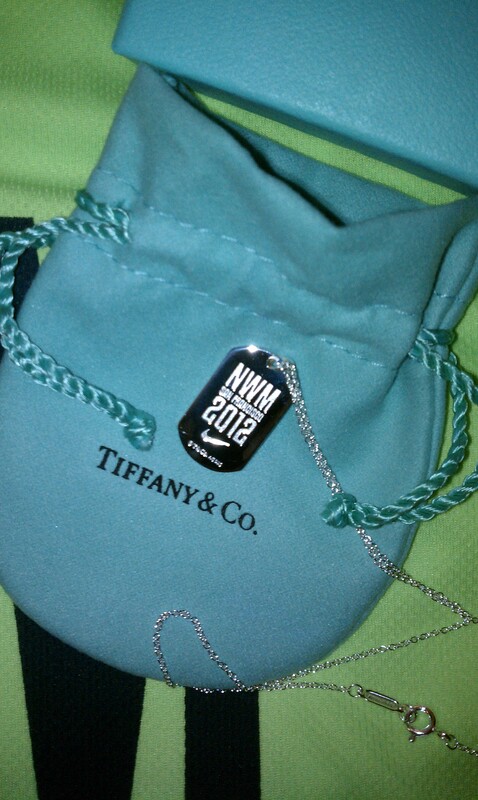 However, the NWM has a limit of 6 hours and 30 minutes in order to get an official time and a finisher’s necklace. I didn’t know if the 6h30m limit was based on gun time or chip time and since I was planning on finishing right around 6 hours, the added 33 minutes to the gun time worried me throughout the race. My recommendation for next year would be to have a start corral upfront for the marathoners. Even better than that would be a start time 30 minutes before the half-marathoners. We’re going to be out on the course a lot longer than the half-marathoners so why shouldn’t we get an earlier start and our own special start corral and gear bus? The course felt a little easier this year because it hadn’t changed from last year. However, the organizers weren’t prepared for the number of people on the course. 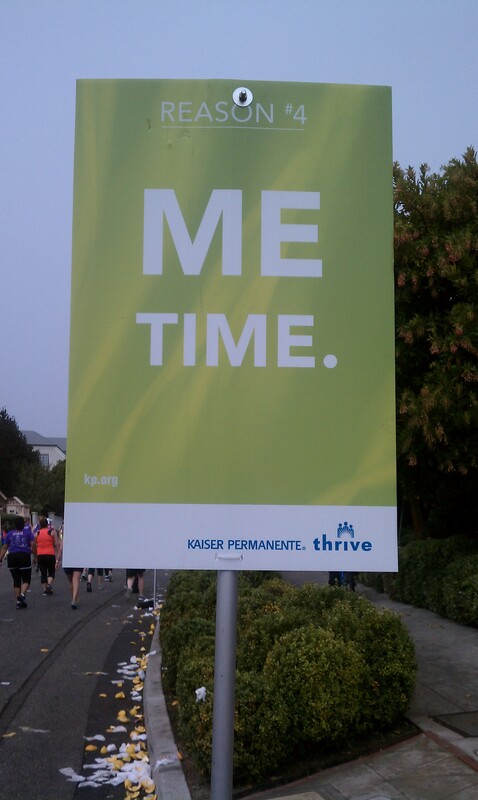 Either that, or this event is really geared towards half-marathoners. The weather was perfect fall running weather. It was overcast and foggy and it stayed that way throughout the race. The sun was out in the city by the time we took the shuttles back to the start line and that was just perfect. The first aid station that was supposed to have Shot Bloks was out by the time I got there. I wasn’t annoyed because I had my own gels. But it did bother me when I saw how many full sleeves of Shot Bloks other runners had thrown on the ground just past the aid station and then I had to wonder how many half-marathoners had been served. By the time I passed the bra exchange station, they only had a few XS and XL bras left. Slightly better than last year because last year, when I reached the bra exchange station, they were completely out. Again, I had to wonder how many half-marathoners had been served. My quads seized up around mile 12 and after that, every step was agony. 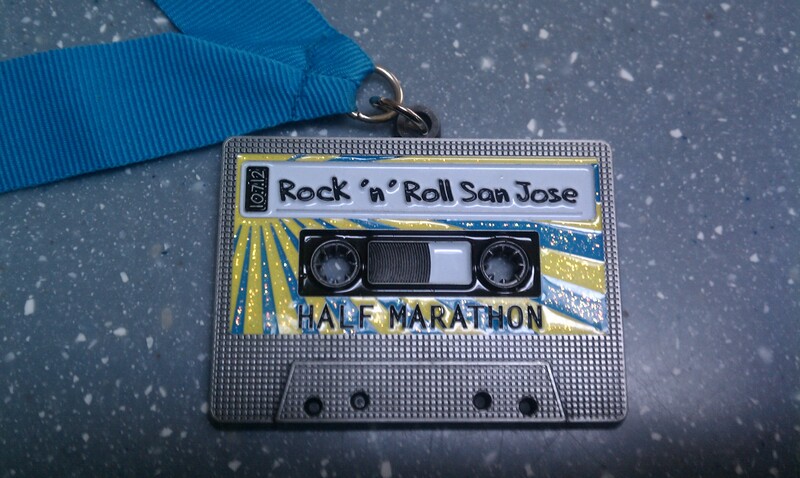 It was probably due to having run the Rock ‘n’ Roll San Jose Half-Marathon the weekend before. Even though my legs felt like they had recovered from that event, they really hadn’t. Thank goodness in 2013 there will be a weekend between these two events, as there was in 2011! Once the marathon course splits from the half-marathon course, things get pretty desolate. The aid stations were much smaller and seemed to be spaced further apart. I tried really hard not to hate the part of the course around Lake Merced but even though it wasn’t hot like last year, Lake Merced sucked. 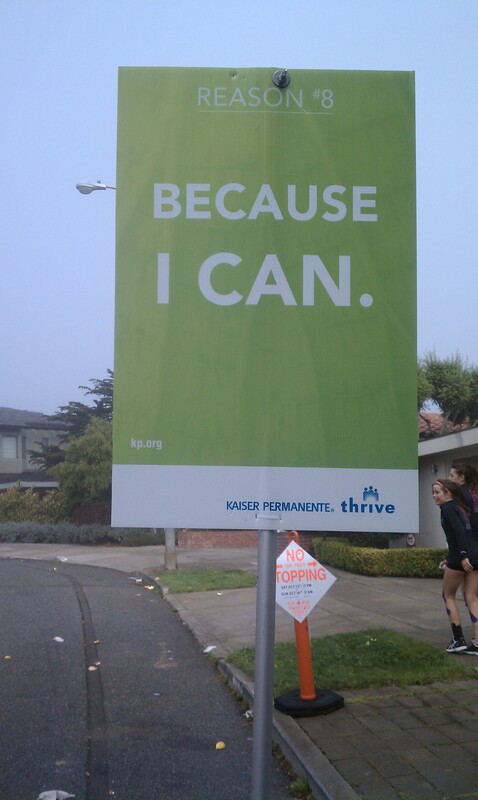 I wonder if the organizers can find a way to get the 26.2 miles without having to go around Lake Merced? I really wish that Team in Training would teach their runners and walkers proper race etiquette. NWM posted some guidelines on Facebook about walkers walking on the right and other common sense tips about sharing the road on race day. A lot of people got pissy about that, saying that they had paid their entry fee and so could run or walk any way and anywhere they wanted to on race day. It’s so inconsiderate! It was exhausting to run around gangs of Team in Training participants who were walking 4 or 5 people across. And then when I would try to squeeze in between gangs of Team in Training participants, they would give me dirty looks even though I would politely murmur, “On your right,” or “Excuse me.” Again, don’t get me wrong – I have nothing against walkers because I took plenty of walk breaks and walked from about mile 24.5 to 25.5 – I just wish they would be considerate of others on the course. If you want to stroll with 3 or 4 of your friends spread out across the street, don’t do it in a race. The comment about this event being more geared to half-marathoners really resonates with me. I am not a distance snob by any means – I love the half-marathon distance. I do mind, however, missing out on stuff both on the race course and in the finish area because it’s all been taken by people who’ve run the shorter distance. I feel the same way when I’m running a 10k event that also has a 5k. We all pay the same entry fee so we should all get the same opportunities. 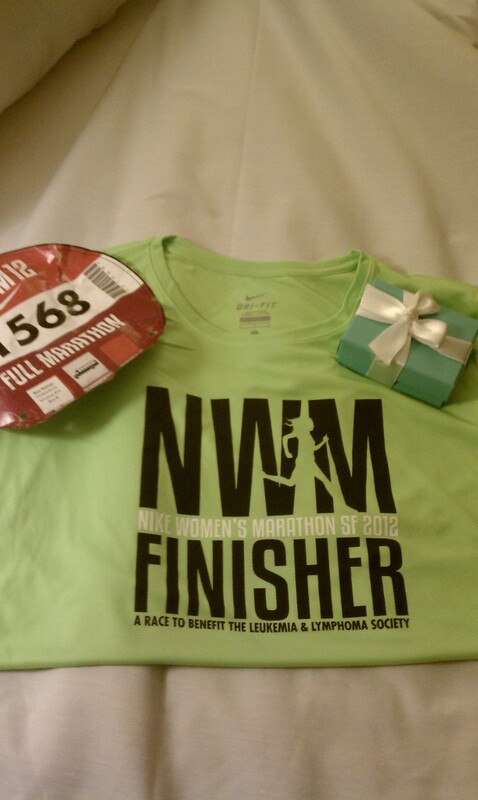 The NWM Finisher t-shirt this year is a bright neon green. Mine is short-sleeved although I saw some posts that make me wonder if a long-sleeve t-shirt was an option. Maybe for the half-marathoners and the faster marathoners? The cool thing about the finisher t-shirt is that it’s made from recycled water bottles. 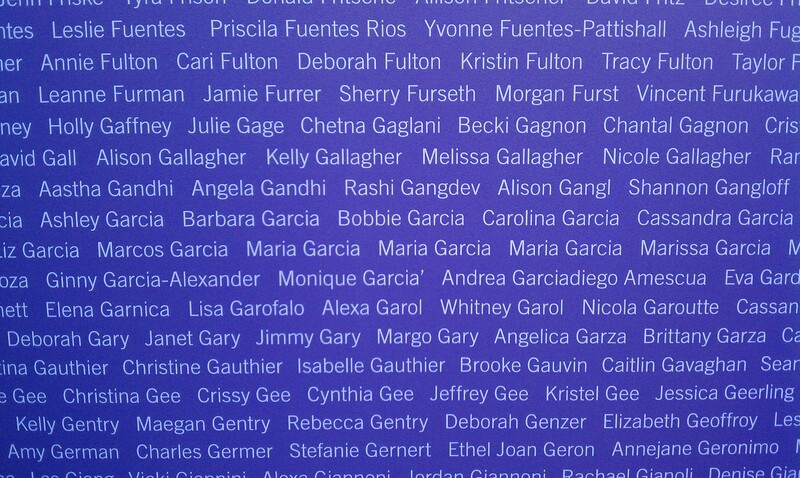 I was not offered a finisher’s necklace in the pretty blue box – I had to ask for it. The Safeway grocery bags were out of stock. All of the Neutragena products were out of stock. Vendors were beginning to break down their tents. The gear check buses were being emptied haphazardly into brown boxes. I realize that it took me 6 hours to finish the race plus the additional 33+ minutes it took to reach the start line but I wasn’t the last one across the finish line and it was demoralizing that there wasn’t as much care and excitement for the slow people who gutted out the entire 26.2 miles. The chocolate milk was in the Team-in-Training tent. Foam rollers and yoga mats were only for Team-in-Training participants. They really set this event up as “Haves” vs. “Have Nots.” I was always taught that if you don’t bring enough for everyone, you shouldn’t bring anything at all. Thumbs UP: Gear check was much improved over last year. 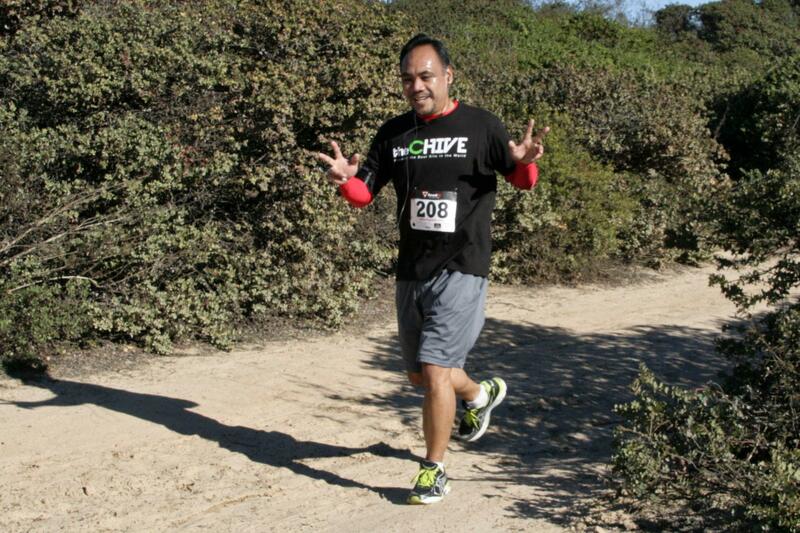 Thumbs DOWN: The official race photographer for this race didn’t do that great a job. For being out on the course for over 6 hours, there were only 10 pictures of me, 4 of which were me crossing the finish line, 1 of which was of me posing at the end. I had to search for myself in the other 5 pictures because there were so many people. It would have been nice to have some official race photographers taking pictures of marathoners around Lake Merced. Thumbs UP: The weather was perfect for running although apparently not for GPS devices. Thumbs DOWN: The length of time it took to get to the finish line had a negative mental impact on me because I was worried that I wouldn’t get my finisher’s necklace. Thumbs UP: Some spectators had great signs. Thumbs DOWN: Not having enough items at the aid stations for slow runners. Not having enough bras at the bra exchange for slow runners. Not having enough post-race goodies for the slow marathon runners. Thumbs UP: A Tiffany-designed finisher’s necklace. Enough said. If Nike wants to turn this into a half-marathon event, that’s what it should do. Don’t call it a marathon when you end up catering to the half-marathoners and treat the full marathoners as an after-thought. 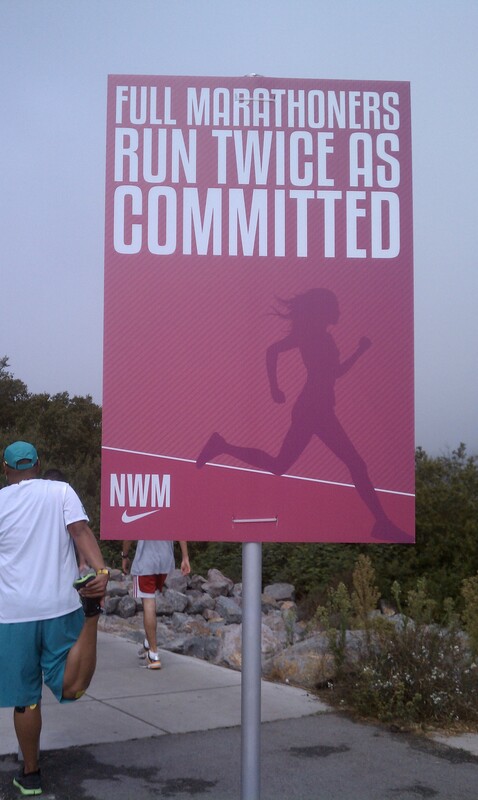 As Nike’s marathon motivational posters say – a full marathon is tough, full marathoners are twice as committed. Well, if Nike really believes that, then they ought to prove it with their actions. 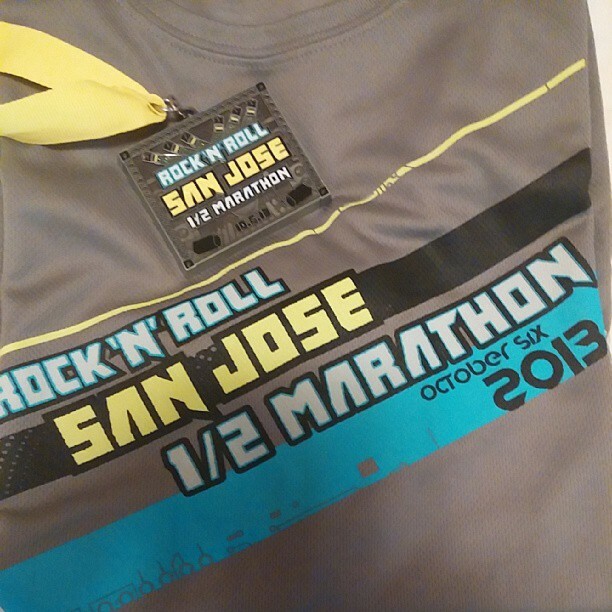 The 2012 San Jose Rock ‘n’ Roll Half-marathon took place on Sunday, 7 October 2012. This is the fourth time that I’ve run this race and, as has become my tradition, I signed up for the 2013 race while at the expo on Friday. The lack of communication from the race organizers troubled me this year. For this event, I didn’t get a single email, not even a reminder to print my confirmation before going to the expo. This may be typical for a Rock ‘n’ Roll Race Series (RnR) event but since I’ve been getting emails from Nike about the Nike Women’s Marathon (NWM), I can’t help but compare the two events and NWM has definitely gone the extra mile to create buzz and excitement about its event. Perhaps the RnR is getting so big that they are starting to lose their grip on the details. That’s just speculation, of course. But anyone looking at the menu of events will agree – the RnR is expanding rapidly both here and around the world. As I was running the race, I decided that my race reports needed some structure and came up with some headings that I usually include in a race report. Let me know what you think about the more structured format. The expo seems to get bigger every year but this year could have just been an illusion because of the construction going on in the Convention Center. I felt like a rat in a maze going from one part of check in to the next and then finally to the RnR store and then into the expo. The volunteers at the packet pick-up area were friendly, which always helps to set the right tone before entering the expo. When I moved on to the t-shirt area, I got a volunteer who didn’t speak or smile. He didn’t return my greeting, simply held up a t-shirt as if to say, “Is this the right size?” and then just handed it to me. A little disconcerting but not the end of the world. In retrospect, I should have gone for a unisex shirt instead of the gender-specific shirt because the unisex shirts are roomier. There were a lot of vendors at the expo. It was exciting to see the booths for other upcoming races as well as the snack and product booths. P.F. Changs, Jamba Juice, and the Sports Authority had teams of volunteers at work trying to get people to sign up for the loyalty programs. I guess I’m a sucker because I signed up for both the P.F. Changs Warrior program and the Sports Authority program. I managed to get out of the expo with only the things I intended to get – my race bag, my RnR t-shirt, my race registration for the 2013 event, and a hat for race day. As in prior years, the gear check area was uncrowded and well-organized. This may be because a lot of people stayed in hotels very close to the start/finish area and chose not to check their gear. Or it could just be that the RnR has gear check down to a science. I’m hoping that the NWM will have learned some lessons from last year’s horrific gear check scenario and will have made some improvements. The start corrals were clearly marked as usual and easy to get into. As with prior years – and most races – people are pretty clueless when the national anthem is being sung. The people in my corral kept talking, no one removed their hats or put their hands over their hearts. And of course, there were the obligatory cheers and whoo-hoos at the crescendo of the national anthem, which also annoys me. But I still always get chills when I hear the national anthem despite the rudeness of others. The Cheer Teams were enthusiastic and loud but not too loud. They seemed more focused on cheering for the runners this year, which was nice. I had a problem with the bands on the course, though. I didn’t pack my headphones, which meant that I couldn’t listen to music on the run. That made the bands that much more important to me. Some of the bands didn’t seem to realize that it’s called the “Rock ‘n’ Roll” race series and were playing slow ballads. Needless to say, I am going to make sure to put a spare pair of headphones in my vehicle so that I am never again caught without music and dependent on the on-course bands. Most of the volunteers on the race course were fantastic – cheering and clapping or smiling and clapping. At some of the later water stops, however, the kids manning the water stops seemed more interested in splashing each other with water instead of handing it out to the runners. I missed the blonde lady at the finish line who usually announces, encourages, and congratulates runners as they approach the finish line. The finish line energy seemed flat without her. I’ve commented on this before but the Rock ‘n’ Roll San Jose organizers really need to provide a little bag or something for runners to put the post-race food into. As we walk through the finish area, we’re given water, Gatorade, bananas, Snickers Marathon bars, bagels, bags of pretzels, coupons if we beat the P.F. Chang’s dragon, chocolate milk, and other goodies. It’s awkward trying to hold all of that stuff and eat and drink at the same time. I think that the Rock ‘n’ Roll San Jose organizers ought to take a page from the Big Sur Half-Marathon organizers and bag everything up in a little brown paper bag and hand that to runners as they go through the finish area. The finisher’s medal was great – it was designed to look like a cassette tape, something that a lot of the younger runners probably have never seen before! Thumbs UP: Even without the pre-race communication, the organization of this event was impeccable. Thumbs DOWN: Calling a 5-miler a “mini-marathon” is denigrating to those of us who run the half-marathon distance and to those of us who have run a full marathon. What’s wrong with calling it a 5-miler? Thumbs UP: Not running out of gels or Gatorade on the course and having plenty of goodies in the finish area for race participants. I’m looking forward to running this race again next year. Happy running!